The Surbo is usually fitted for normally-aspirated cars, but there is a growing list of turbocharged vehicles fitted with the Surbo. Aren't turbocharged engines already very powerful? They are when the exhaust gas-driven turbocharger is providing boost when the engine is around 3000 rpm. Below that, the exhaust gases are too weak to turn the turbocharger at a sufficient speed to make it compress the air coming in through the air filter. While this happens, the turbocharger represents a load to the engine via the exhaust, and the time to overcome this by pressing more on the accelerator is called turbo lag. Fortunately, the Surbo can reduce turbo lag. Instead of going for a costly ECU remap, which mostly results in running the turbo at a higher constant boost, and this may shorten the life of the engine, the Surbo is a safer alternative as it acts only during acceleration, and makes running at full boost (with full throttle) unnecessary since it takes even turbo engines to the rpm limit with just 1/2 throttle (based on our development car, the turbocharged Peugeot 508 1.6 THP). The logical step next would be to remove the rev limiter, for a bit more revving power. Even if your turbo car has had an ECU remap, pairing it with a Surbo will help you avoid extreme boost pressures since you would not have to press as much on the accelerator. This gives more headroom to further increase performance in other ways. Also, since the Surbo pads the low rpm torque, it may be possible for turbo car owners to change to a slightly larger turbo, which normally introduces more turbo lag. If your turbo car has a manual shift program, use it with Surbo to extract full power with a light throttle action. For example, in manual mode on our tiptronic 508, the rpm limit would be reached in 1st gear with 1/2 throttle, and the gearbox would automatically shift to 2nd gear, and after that, the gear can be shifted up when the speed limit is reached, or when you wish to save fuel on a higher gear. The Surbo was fixed in the original pipe parallel to the windscreen. The result was a lighter throttle, smoother power and easier revving. 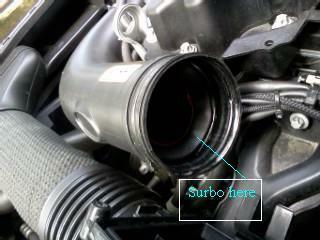 The Surbo was installed in the pipe after the air filter. The owner said he could feel the Surbo, even when operating at very low rpm. 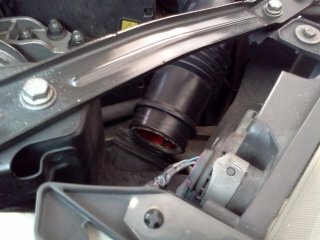 The Surbo was installed in the pipe after the air filter. The owner said his heart was beating very fast as he felt the improved acceleration, especially with little accelerator pressure. The Surbo was installed in the pipe before the air filter. There was a better midrange pull, with revving completely controlled in manual mode. 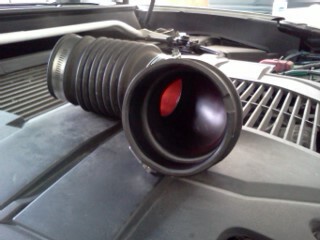 The Surbo was installed in the pipe after the air filter. There was quite a turbo surge with Surbo on, considering that it was such a heavy car. The Surbo was put in the modified metal pipe after the air filter. Lots of boost whenever gear kickdown occurred. The Surbo was put at the inlet of the air filter and managed to impress the owner, said he would tell his M3 friend about it. After fitting, the owner said the engine was not so gruff as before. Strong surge after Surbo activated, and with minimal throttle pressure. More power than most people need so accelerator will be eased off soon and fuel saved, as reported by owner. Pic similar to Peugeot 508 below. At red line, the owner exclaimed that the turbo was not even on yet. In this case, the turbo was worn, leaking or not working well, and the Surbo was able to make the engine come alive again due to increased axial (straight-line) pressure made at the turbo's fresh air inlet and extra exhaust pressure spinning the turbo, and also raising compression in the engine itself. This was a semi-auto, and gearchanges became smoother with Surbo. The turbo surge was strong yet accelerator pressure was little. The owner wrote: "The Surbo device is good. I will as my friends to look for you." In manual mode, the revving was smooth and quick and upon reaching the rpm limit with half throttle with Surbo, the gear would switch automatically to the next gear for seamless power. This car had better torque straightaway and testing continues. This had 154 bhp and the owner, who hardly revved, felt the improved power from a low speed. The Surbo was fitted in the pipe after the air filter. The Surbo was fitted in the pipe after the air filter. The driver said that before Surbo, he was never able to rev that way! 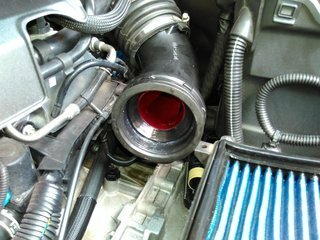 This was fitted by our Brunei dealer, and he said that the the car felt smooth during acceleration and reacted quite fast. This car has a 7 speed auto transmission and a 1.8 litre turbocharged engine making more than 200 bhp. The owner said that the idling became smoother. He wanted more turbo boost below 1800 rpm, and said that the Surbo made some improvement, like giving higher revs and a lighter throttle. There was little deceleration even with the foot off the accelerator, and easier automatic down shifts. Also, overtaking was simpler to prepare and safer, because with the Surbo assisting the engine, it was easier to feel when the turbo was coming. The 2007 Mercedes A class turbo was fitted with Surbo. It brought back some of the turbo's drama. The Nissan Qashqai 1.2 and the Pulsar 1.2 where both equipped with Surbo, which helped the low end power, as both were CVT cars which did not rev much. The objective of the owner, previously running a Suzuki Swift Sport with Surbo, was to reduce turbo lag. So far so good, he said. This car has 217 BHP and 350 Nm of torque and was a rocket with Surbo on, and with low residuals, is a good buy. This Surbo user told a story when he came again to have the Surbo installed in his wife's Peugeot 307 later. His story was that in the past, he had a Subaru Impreza WRX STi, which he had driven back to and left behind in India, meaning he was a fast car driver. What he did was on a trip to Penang Malaysia in the Surbo-equipped 207 GTi, he started off in Johore Bahru with a friend in another STi, but he finished an hour in front of the STi at Penang. Perhaps it was because he saved so much fuel that did not have to stop so many times at petrol stations, or that the 207 GTi ran cooler than the STi, which had to stop more often to cool its turbo. 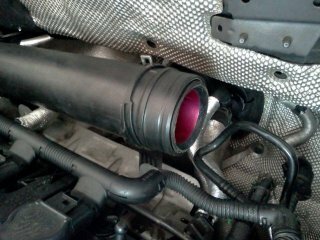 The above, our test car, was fitted with a Surbo in the pipe after the air filter. This engine is used on other Peugeot models (308, 3008, 5008, RCZ), and also on Citroen (C4, C4 Picasso, Grand C4 Picasso, C5) and DS (DS4) models. Manual sequential gear selection using the up down paddles is recommended for revving with the lightest throttle feel, and maximum control. Staring with gear one, maximum torque comes in a big wave at around 1500 rpm and rises to 0.5 bar as the engine surges to 5000 rpm easily with half throttle, and second gear is selected. Less revving is required up the gears as the speed limit is approached. When revving in first gear through a turn, we have to hang on tight to the steering with both hands, and appreciate the fingertip gear control. If revving in gear 1 to the rpm limit, gear 2 will be automatically selected, without using the paddle. This had lots of torque with Surbo, wheel spinning on damp road in first gear. When the gears were held, the rpm meter would swing easily to red line. The owner said that as backing off the throttle made the Surbo work harder and the car go even faster, this was at a new level. The blow off valve used to activate at 2500 rpm, but using the Surbo with less accelerator pressure, blow off occurred at 3500 rpm instead, giving more headroom. He would be going to tune the turbo system settings to take advantage of the new found power. This is the JDM spec WRX in Japan with over 200 horsepower, and the driver said that turbo lag was greatly reduced, and speed improved. The owner of the Subaru Impreza WRX STi 2.5 said that with the Surbo, fuel consumption was lower and there was some mid band improvement. Another 2.0 automatic WRX (2007) fitted with Surbo had a 20 kph increase in top speed. The driver had come looking for a lighter throttle feel, and found it with the Surbo. The turbo came easily, by accelerating and just holding the accelerator (which got the Surbo on). 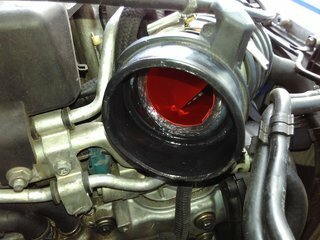 With the Surbo, which he said was a lot of fun a week later, the turbocharger's blow-off valve did not activate anymore. It was possible that the Surbo was aiding the engine to rev faster, and so the engine would run ahead of the turbo, and therefore the turbo boost did not build up to its limit. This will help to avoid the turbo lag that occurs immediately after blow off if acceleration is continued, because the turbo's pressure would fall and it takes time to build up pressure again. This was a repeat Surbo purchaser, the first time for his Alfa Romeo. This had some initial lag and fuel consumption of above ten litres per 100km, and the owner was hoping to improve it with Surbo. 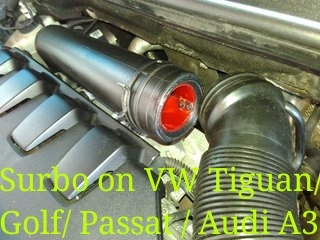 The above was also fitted with a Surbo in the pipe after the air filter. In the case of the Volvo XC90 3.0, the improvement was more power over second gear humps, as the rpm was too low for the turbocharger to be properly spooled. The Surbo helped to cut some of the turbo lag at very low rpm, by delivering a denser exhaust stream that spooled the turbocharger up earlier. Done by our dealer in Thailand, this 407 bhp supercharged and turbcharged hybrid had a "violent first gear" and could reach top speed very quickly. See videos on this model below. The owner called to say that there were fuel savings. The Surbo was fitted to the inlet of the air filter box. The owner could feel the Surbo even at a low rpm. The Surbo managed to cut turbo lag for the above model. Another owner said the car became smoother. The Surbo, together with the original supercharger and turbocharger, made this 1.4 seemingly stronger than the 2.0 above! Gearchanges and pace through corners were terrific. Fortunately roadholding was good. VW Touran 1.4 (twin charged) was also fitted with Surbo. The result was very intense turbocharging even at a low rpm. For another Jetta doing 9 km per litre with a turbo that its mechanic said was worn, with Surbo at half throttle, it could zip from 3000 rpm to its rpm limit in a split second, both in first and second gears. No more road to test in third gear on that day. If third gear and subsequent gears were made shorter and more gears added, we think that the performance would be scintillating. The Surbo is running on the above, owned by an old customer. So far so good, he said. Another belonged to an ECU tuner, who said the effect of the Surbo was very obvious. The 1.2 Golf has also been fitted with Surbo. Tuned to 300 bhp from its original 207 bhp, this GTi felt very intense with the Surbo on. Pic similar to Tiguan above. The rpm would swing rapidly from 3000 rpm to 5000 rpm when Surbo is activated at half throttle, before gearchange occurs automatically. Pic similar to Tiguan above. As the Surbo brings the engine to the rpm red line with just half throttle when the gear is held constant, and since the throttle is not floored, it means that the pressure in the turbocharger could still be well below the blow-off pressure value even at red line, and therefore therefore a higher rpm limit may be set by car makers, so extending the peak power of the turbocharged vehicle. The 200 bhp engine was fitted with Surbo and the effect was among the best of any VW, particularly in third gear with a sustained pull.